Provides collaborative, live conferencing, e-commerce, salesforce software for businesses and educational institutions. 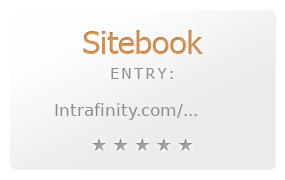 Reviews and Comments for Intrafinity Inc.
Form Designer enables organizations to seamlessly design online forms and integrate them with workflow processes. Web-based portal for organization and collaboration. Share files, links, and calendars, communicate with white boards and forums, and organize projects. Intuitive to use and very customizable. Information about enterprise management (including network management, systems management, and service level management) and Enterprise Management Associates. Contains white papers, and staff biographies. Solutions for implementing Knowledge Management, Content Management, Document Management and Quality System Management Practices. elevateIT provides content management solutions for distributed organisations, portal management, document management and workflow management. It is an extension of ZOPE/Plone. Integrated IT lifecycle management. Specializing in XP migration, patch management, backup and recovery, asset management, lifecycle management, imaging, software inventory, hardware inventory, software delivery, server deployment, systems management, and software license management. Route accounting system, route management system, office coffee management, distribution management, commissary management, moneyroom, and warehouse management software. Modular integrated information management system incorporating document management, workflow, records management and web content management. From departmental to enterprise-wide use, 25 to 5,000 users. Internet-enabled. Product lifecycle management software including configuration and change management, file management, document management, and quality control. Features general help desk, project management, asset management, issue tracking, sales management, and IT project and resource management. Provides remote console management, out of band kvm management, remote power management and network management software. Network management software that delivers a fully integrated performance, availability and resource management solution. This includes WAN/LAN management, SAA Performance, ITIL conformance, event management and extensive real time and historical reporting. Tracking software that is fully customizable to fit your business. Web-Based Bug, defect, change management, contact management, quality management, customer support, help desk, and customer relationship management tracking. PeopleSoft develops enterprise application software. These enterprise solutions are used for customer relationship management, human resource management, financial management, supply chain management, and manufacturing management. Incident tracking and resolution, email management, employee Web portal, knowledge management, and asset management. Supplies document management, web content management and digital asset management solutions based on XML. Offer compliance management software including document control, audit management and training management solutions. Software for fund raising, donor management, donation management, volunteer management, and pledge tracking. Document management solutions for compliance management, records management, and supporting business processes with archived documents. A web based suite of applications for time management, issues management, and change management. Provides report management services for mainframes and operation management, job scheduling, document management and COLD systems for networked PCS. By Steve Jerman and John Crandall. Two standards may alleviate management headaches for both end users and management software developers. Configuration management system providing process management, issue/problem tracking, version control, and release management. UK-based consultancy specialized in document management, content and records management, workflow and business process management. Develops network management applications for the data communications and network service provider industry. Their NEBULA product line provides proactive network management solutions in the areas of performance reporting and fault management for ATM, frame relay and IP networks. Provides a suite of Web-based software including a help desk, asset management, bug tracking, and sales contact management systems. Software for project management, resource management and time recording, by Advanced Management Solutions. Includes company, product and service information. If the business hours of Intrafinity Inc. in may vary on holidays like Valentine’s Day, Washington’s Birthday, St. Patrick’s Day, Easter, Easter eve and Mother’s day. We display standard opening hours and price ranges in our profile site. We recommend to check out intrafinity.com/ for further information. You can also search for Alternatives for intrafinity.com/ on our Review Site Sitebook.org All trademarks are the property of their respective owners. If we should delete this entry, please send us a short E-Mail.